MIDNIGHT MOONLIGHT + PERFECT MATCH ~ For those that loved the sweet moonlit smell of nature in our Vardo perfume, this one is for you! A combination of blackberries, dried grasses and dusty sage teamed with our happy, cozy, feel good phero for couples. Ultra saturated, beautiful original fragrances for scenting your home, with the addition of social atmosphere enhancing pheromones! We never use pre-mixed commercial fragrances, all of our scents are crafted in our studio. You'll LOVE the gorgeous aromas and the lavish quality of our Wax Melts! 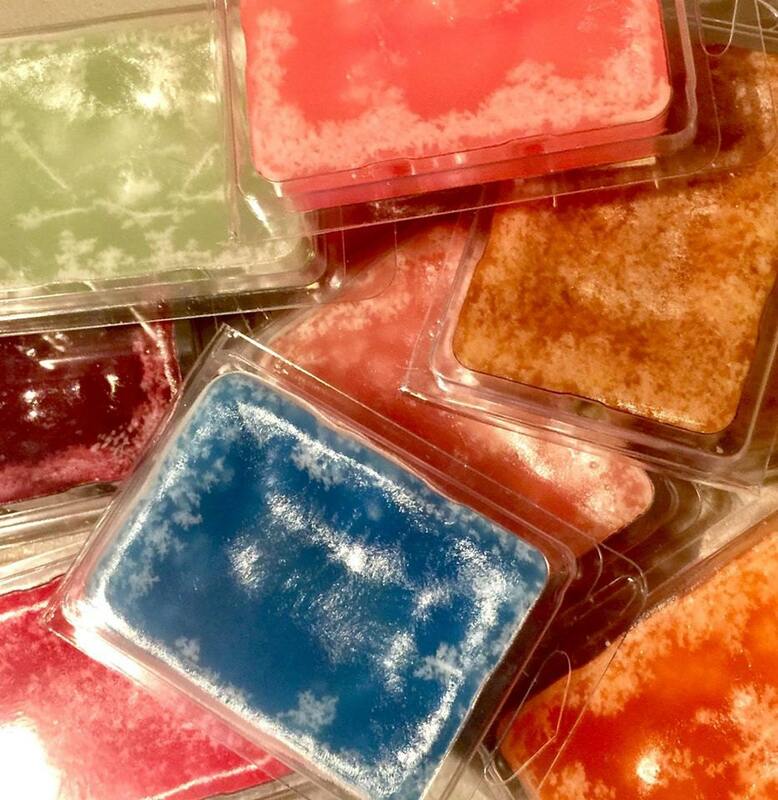 Wax melts are like candles without the wick, and because they do not need to support a wick, we can make them super-saturated with perfume oil, (2 to 3 times the norm!). This makes them quick to melt and diffuse the scent throughout the room. 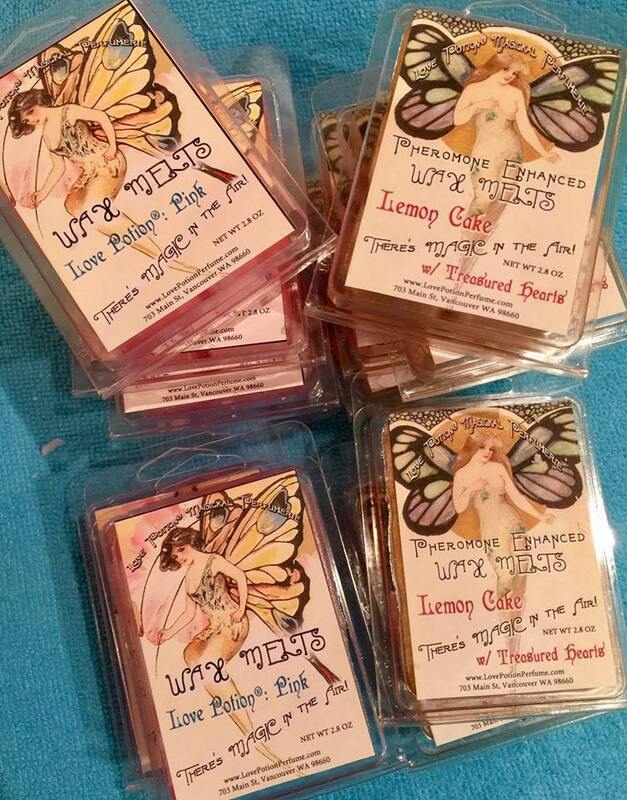 Another added benefit to using wax melts, is that UNLIKE candles, we CAN add pheromones to them. 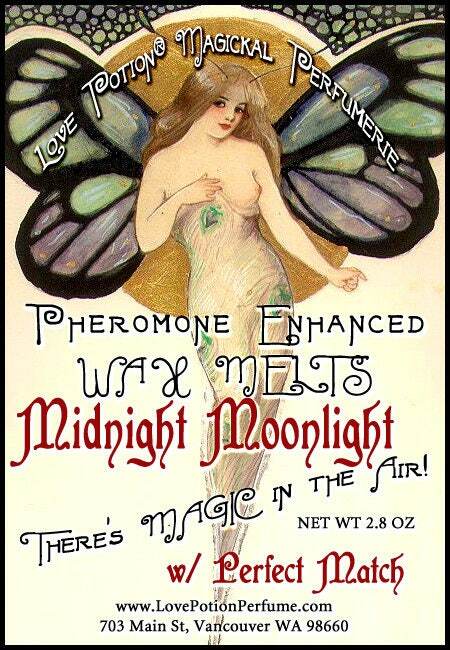 I recently found out that a lot of people are unaware of the fact that pheromones will produce a toxic gas upon touching flame, which makes pheromone candles unsafe. However, there is no such risk with wax melts, as they never touch flame, the wax is simply warmed and melted, and thus diffused, and that is completely safe. Pop out of the container, and place ONE CUBE in your electric or candle powered oil/wax/potpourri warmer. When the scent is gone, (approx 4 hours), wait for the wax to harden again, and it will easily pop out of your warmer when cool. These are crafted with a hard "sparkle" paraffin wax which is known for the best throw. Fills a whole room with amazing scent! You might want to burn them for half an hour to an hour, and save for re-melting later if the scent is too strong to burn continuously for your taste. The fragrances in these are VERY concentrated! The scent will remain in the air for hours after your tea light goes out.